Fungi in general are very important to soil health. By avoiding tilling, you don't tear up the tiny mycellium running through the soil... and by letting things rot in peace, you Deepen the Awesomeness Of The Mystical Soil Web. Or something along those lines. I created a compost tumbler out of a 55-gallon drum (which sounds better on paper than it works in real life) and then forgot to tumble it for a while. An incredible flush of mushrooms was the result. 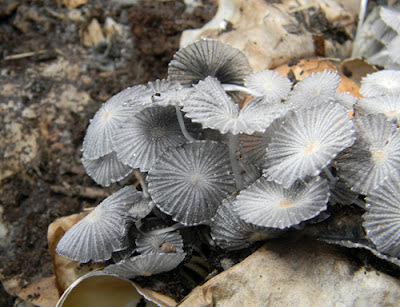 Fungi decompose what many bacteria can't. Wood and paper fibers, for instance. If you see them in your yard or your compost, be happy. Good things are happening. The mushrooms you see, interestingly, are only the fruiting body of what is often a much larger organism. Tiny threads from one entity could be woven beneath the surface of your entire yard... only to reveal themselves as an occasional mushroom on the surface once in a blue moon. In a compost pile, fungi take over after the thermophilic bacteria, yeasts and other microorganisms have done a lot of the primary work. As the pile cools, they move in and help complete the process of decomposition. 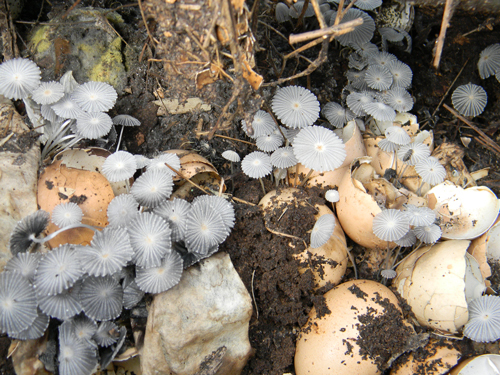 Yes, some fungi attack our plants... but many others feed them in ways we can hardly imagine. From extending the reach of plant roots to providing nutrients from sources unavailable to trees, to dissolving rock, fungi are vital. And, though many are inedible, they do bring a delicate ethereal beauty that's all their own. I feel badly about my attitude when finding mushrooms in my yard; the dreaded fairy ring. Now, after doing some research on how to get rid of them for good, I have discovered that I can feel safe letting them continue to grow. I had no idea of their value to gardeners and to the earth in general. I really learned so much from this post. How about worms? Knowing the answer to this question will help my blogs on my site https://www.greenfromthegarden.com Are mushrooms and worms compatible in the garden or the yard? Thank you for this great post! Generally, the more life the better. Worms are basically a primary decomposer, along with beetles, ants, etc. and their action is complemented by bacteria and then usually finished by the fungi. Fungi have the ability to break down wood and even rock. In fact, lichens (which are a symbiotic organism composed of fungi and algae together) can live in brutal conditions on sheer rock faces, slowly breaking down the surface and paving the way for plants to move in later. Mushrooms are pikers compared to some of their more extreme relations.